Small Gas Chromatography unit SRI? What can you tell me about this unit? I have no GC experience. I am selling my embroidery machine from my old business and perhaps might look at analytics a bit. My goal is recreational learning so learning the process itself is part of the fun for me. However as a practical matter is this the kind of unit that will consistently produce accurate results for determining D9 THC? What considerations are there for a machine like this? These work nice. Can’t detect any acids without derivitization and I don’t know how well they resolve isomers (different columns can make a lot of progress on that problem though). Can’t identify unknowns so you need standards for every compound you’re interested in. Keep an eye out for a used one. My buddy and i were gonna pull the trigher on a use 8610 gs from sri for hella cheap. It will do pretty much all you need. We talked one of the trainers ears off for about a week about it. Edit…i guess it was an 8610… @Demontrich you might wanna ask what the difference between the A and the C models. This was a few years ago so my memory is spotty at best but you might wanna inquire about that. They offer free in house training, with purchase from them. They also have a used inventory. 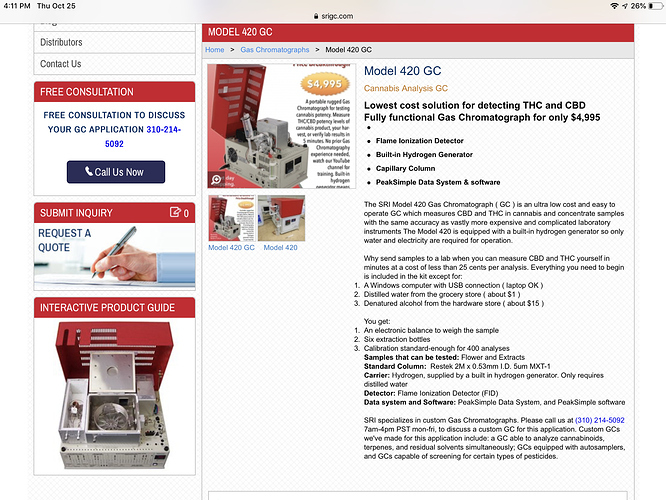 I would hope that any GC for sale that recommends “denatured alcohol from the hardware store” has easily replaceable columns and injection heads that are affordable, assuming that is the solvent you are using to extract samples for testing. No reason why it shouldn’t work, I’m surprised the built in hydrogen generator is sufficient. I had to use a fairly expensive standalone hydrogen generator for the HP 5890 I used to run. I have one in house, testing is normally within 8% of the outside labs numbers. you will have to purchase standards from a source like restek and create a calibration curve for the system, this is how it tests your concentrates. If you calibrate accurately with serial dilutions then your testing will be accurate. However it gets a bit finicky when testing anything above an 80% potency, and will require multiple dilutions to be accurate. just use methanol instead of denatured. I think am 8 point variance is enough for me to shy away. I will certainly be interested in 90+ percentages and want to determine with greater accuracy the diferences between pass one and two, and two and three, and so on. I also raised an eyebrow when the marketing emphasized the use of denatured alcohol but as I said I have zero know how so best to listen to the pros on this. Your right. My bookmarks have it saved as the 8610c, NOT A.
I’ve seen used deals for the 8610c on eBay. Are consumables and software to run these things easy to get? How about the calibration THC, CBD, CBN solutions from restek? Is this something an at home grower could setup and utilize? I’ve watched a few training videos and it looks simple enough to test flower. I would love to be able to score a 3k used GC and test my meds myself. Doing some more digging it looks like the software can be had free. The problem is even if you find a used 8610c the chance of it having the cannabis setup ( correct column and sensor, etc.) May be tough. Manufacturer : Whatman. Model : 75-45. The pictures displayed in this website are not manufacturer`s catalog reproductions but actual pictures of this item taken at our facility. Made in : USA. You may have a change of mind. | eBay! A budget basement hack like me could score a cheap rebranded 8610c and source the right column and detector and should be able to get it working. I wonder if those 800 buck scientific units have the FID detector. I don’t see the FID in the pictures for that listing. they are pretty simple to get up and running, and consumables are pretty inexpensive. Once setup they are very robust. getting consistent injections out of the operator requires that they care. and understand what parallax error is. After seeing that listing, realistically how much money do this this would cost to test properly? I’d really like to do some in-house testing of my concentrates as well as some of the local dispensaries stuff cause I just can’t believe some of their numbers. I’d certainly take the risk and make a thread for others if I can get some help from the community? The question I have is hypothetical. Suppose a person brought 100% D9 THC into a lab for testing. I have seen the number crunching they do to estimate things like THCA which cannot be measured directly. Question: would a typical lab return a result of 100% IF the sample was indeed 100% D9 THC or as a practical matter would these calculated adjustments lead a lab to report a lower percentage of D9 than is actually present? I paid $12k used for a $18K list machine. direct from dispensary that had been using it. I’ve seem appropriate ones on Ebay for less than $4k on a couple of occasions. adding a FID to one that doesn’t have one can run you $2k from SRI. Consumables are cheap. hardware store solvent (Denatured Ethanol, Acetone, Toluene all work), and $150 for standards every now and then. First things first, you will want to have a good analytical chemist to consult with. I’m a synthetic organic chemist so I used these but never had to maintain one or do any analytical work. Is my SM gone? Is my product there? Things will go wrong and usually no one in the industry has a service plan. I’m in the process of replacing all the seals and inlet. It’s not for kids but easier than HPLC maintenance (imo). There are plenty of videos and write-ups to help. We run a GC-FID for oil. They will resolve d8 from d9 but my method uses hydrogen as a carrier gas (for now). We used restek standards to create a calibration curve but I never liked the results. I was told to go to an auto-sampler. I’m going to try again, using hot injection technique. Then I’ll but an auto-sampler. No one has mentioned using external or internal standards which I assume they are using if they are hand injecting. calibration curve. I use the best methanol and filter every sample, probably overkill but whatever. That’s all I can think of. Sounds like we have knowledgeable people on this forum. I love this place.